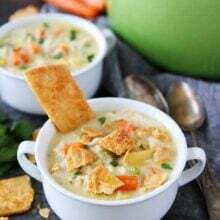 Easy Chicken and Rice Soup-this easy chicken and rice soup is perfect for a cold day and makes a great weeknight meal. 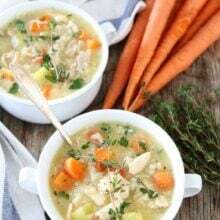 This Easy Chicken and Rice Soup has been on our blog from the very beginning, it is a family favorite recipe and a perfect weeknight meal. The soup is full of vegetables, chicken, and rice. The fresh thyme adds great flavor too. 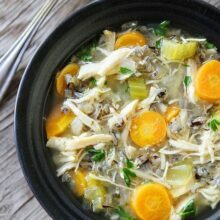 This Easy Chicken and Rice Soup is the soup you make when you are sick or when someone else is sick and in need of a warm bowl of comfort. It is the soup you make when you are feeling lazy, but want a hearty, homemade meal. It is the soup you make when your picky kids say they won’t eat dinner, so you make this soup and they eat a big bowl. It is the soup you make when it is cold outside and you need to warm up. It is the BEST soup recipe to have on hand because it is so easy and everyone loves it. To keep it easy, we like to use rotisserie chicken from the store or leftover chicken. If you have leftover turkey from the holidays or a big family meal, you can use turkey instead. It works just as well. You can use wild rice or brown rice, it will just take a little longer to cook. This soup also freezes well, another reason to love it! 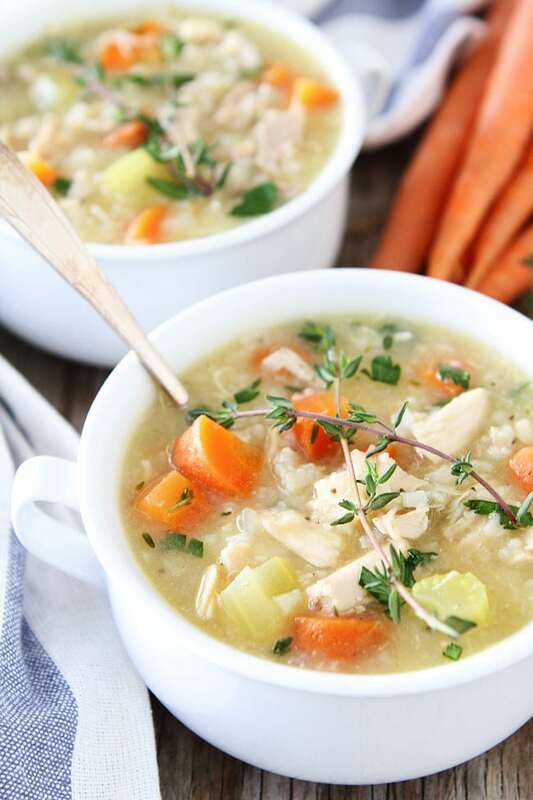 Easy Chicken and Rice Soup, it doesn’t get any easier than this folks! Warm up with a bowl today! The perfect soup for a cold day or if you have a cold! It also makes a great weeknight meal. Place a large pot over medium heat and add the olive oil. Add the onion, garlic, carrots, celery, thyme and bay leaf. Cook and stir for about 6 minutes, until the vegetables are softened but not browned. Pour in the chicken broth and water and bring the liquid to a boil. Add in the rice and chicken; season with salt and pepper. Cook on medium-low until the rice is tender, about 25-30 minutes. Serve warm. *Note-for the shredded chicken you can use rotisserie chicken or leftover chicken and shred it. To cook the chicken for the soup, bring a pot of water on the stove and add two chicken breast, that have been cut into large pieces. Boil the chicken until it is cooked all the way through and there is no pink left. This will take about 7 minutes or so. Drain the water and shred the chicken once it is cooled. I use 2 forks to shred the chicken. You can also use leftover turkey in this soup recipe. You can use wild rice or brown rice, it will just take a little longer to cook! If the soup gets too thick, add more chicken broth. Soup looks goooood, Aunt Ria! 😉 I have to say that chicken and rice soup is probably one of my favorites too, especially in the winter. 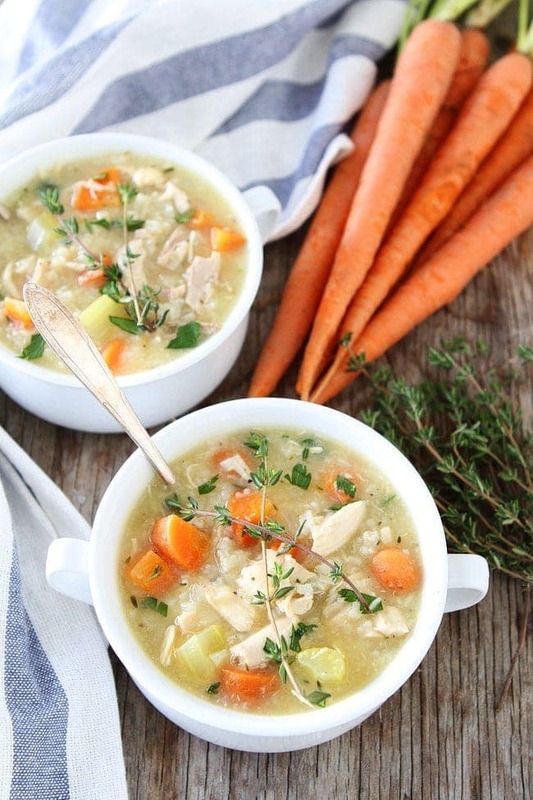 Mmm… I always want to make homemade chicken soup and never do. Usually because when I crave it, I have a cold and don’t want to do the work! But I am never satisfied with the canned stuff! I should make this and freeze it for a rainy day! Chicken soup is good for the soul, but I don’t think I’ll wait to be under the weather before I have a huge bowl of deliciousness. Aunt Ria? How adorable is that? I love it! Such a great sister you are to bring this fabulous soup to them. Way better than ANYTHING that comes in a can. What are you up to this weekend? Josh is coming home from a work trip tonight and I CANNOT wait. Teaching tonight and tomorrow, tomorrow night we’re having friends over for a mini party, Sunday brunch with my mama to celebrate her birthday! <3 ya! Hope you're feeling and doing well. How sweet! Chicken and rice is my favorite soup, looks delicious. I tried parsley it better taste. Did you cover it? I’ve been wanting to post a chicken soup recipe too, but my pictures weren’t good. Yours is great! A light and fulfilling soup! This looks so hearty and warming, Maria. I’m sure your sister and her family really appreciate some home cooking from you! Mmm, yum! This looks so warm and comforting. It’s supposed to be cold here this weekend, this would be a perfect dinner! This is exactly the type of recipe I need to help me in the adventure of learning to cook. It’s my goal this year. Thank you! Sounds delicious! But couldn’t you use the water from cooking the breasts as a substitute for some of the chicken broth? You are such an awesome aunt! I’m pretty sure this soup would make anyone feel better. And an oreo brownie certainly wouldn’t hurt! I’d ALMOST try to get sick, if I thought I could get some of that soup. It looks wonderful. That soup looks so good, it ALMOST makes me want to be slightly sick if I could get some. My favorite! 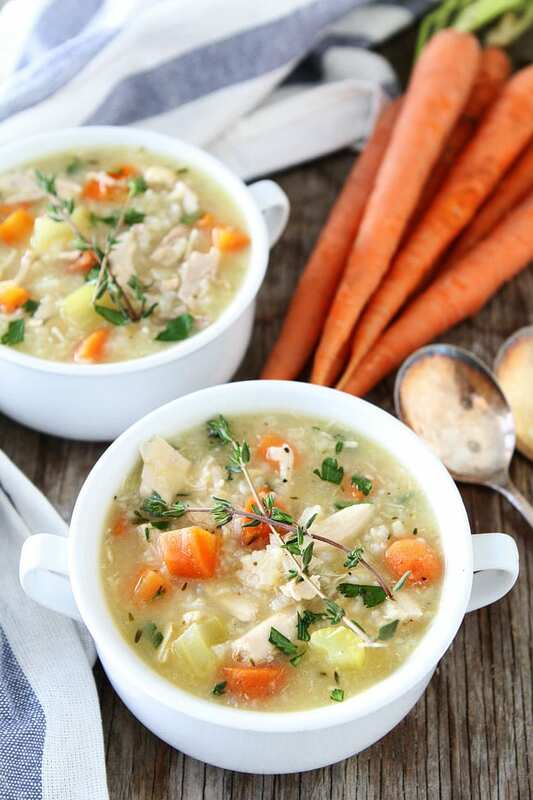 I love chicken and rice soup–and it is so, so good for you. Looks wonderful! Your family is lucky to have you around when they get sick. This gorgeous soup would make anyone feel so much better. Enjoy your weekend! This looks wonderful Maria! I really need to make soup more often and chicken & rice is one of my favorites. mmmm, that’s a big bowl of healing right there! delicious! My kids grew up with chicken and rice soup when ever they were sick, body or soul. Your soup looks beautiful and the recipe sounds delicious! I love Chicken and Rice! It reminds me of going to my Grandma’s house after school, and she’d make this for me as an afterschool snack. Total comfort food. I could use a big bowl of this for my sick house! I’m loving this soup recipe! Looks fantastic. Love…love..love Chicken Rice Soup and it’s one of my fallback recipes when I don’t feel like cooking. Turkey Rice is another fav! There’s no point in questioning it, chicken soup is better than any medication when it comes to achy-fever-cold-flu. Your sister’s family is lucky to have you so close. Your recipe looks great … perfect for all of our endless cold winter days here in Boston. I love the addition of the fresh thyme. I’ve been making tons of soups lately … this would be a nice addition. What a comforting soup – I wish I had a big bowl for lunch right now! I stumbled upon your blog earlier looking for this soup in particular. I used shredded turkey instead, ALMOST finishing the massive amount I had leftover from Thanksgiving, and it was delicious. Reminds me of grandma’s cooking. That is a good thing. Thanks. Oh good, glad they liked it! We had a snow day (well Ice day) down here in TX and this soup was a huge hit for the gang! Thank you for a wonderful lunch recipe – full tummies are resting now. Glad the soup help keep you warm! Tried this soup for the first time and it was awesome! Didn’t have a bay leaf, but it worked out. The fresh thyme really makes it amazing. I also put a couple dashes of dried basil in… super yummy! Thanks for posting! You are welcome! Glad you liked the soup! Yum! I made this for dinner with leftover baked chicken and arborio rice because that’s what I had on hand. Definitely a keeper! Sitting at home in Scotland on a wet damp day, and full of the cold.I need some chicken and rice soup, just like my grannie used to make.Aunt Rita’s soup look’s just like my grannies soup, so am of to the store to get the ingredients.Many thank’s . Will you please post the nutrition information for this delicious soup? Awesome soup. The doctor recommended chicken rice soup for an upset stomach. I HATE buying canned anything when I can make my own. I googled for a rice and yours popped up. It worked like a charm. I tweaked it a little; adding Italian Seasoning instead of thyme. Every recipe of yours I have tried I have LOVED. This is a wonderful soup! Now I always add the shredded or chopped chicken at the end just before serving, that way it stays in pieces and doesn’t fall apart. Also, when boiling chicken pieces, if you don’t have any cooked chicken around, use the boiling broth that you make when you boil the chicken!! We absolutely loved this recipe! So easy so you can make this on a soccer practice night…just perfect for a busy family. Thanks for your recipe! My husband has been feeling sick, and on the way home from church yesterday he asked me to make some chicken and rice soup to help him feel better. I’ve never made it before, and I found your recipe from a google search. I’m glad I did! He loved it and has been eating it for the past 2 days! It’s definitely a keeper. Thanks so much! Awesome, I have made Chicken Noodle Soup for years, but lately wanted to make Chicken and Rice. Yours was the first recipe I came across and I’m sold! In fact it will be done in 8 minutes. Very good recipe. The only thing I did different was use the chicken broth I cooked the chicken in for the soup. I also added a fresh tomato from my garden. Delicious. A little parmesan sprinkled on top–yum. Made this last night and it was a hit!!!! Thank you for this, I will be making it regularly. I looked up a recipe for chicken and rice soup on google, and stumbled across this one. Thank you Google! This was my first attempt at chicken with rice soup, and it was a success. This will be my go to for chicken with rice. Thanks for posting. Was looking for a simple recipe to make for our under the weather family and this was a homerun! Since finding this recipe a few weeks ago, I have made it 5 times. It is the best flavoured soup I have ever had, we love it ! This soup is awesome. I am cooking my second batch right now. Thank you!! I was sitting here what to make for dinner. Now I know. I am however going to use yellow rice and a pinch of hot curry powder – clear the head up a bit. Awesome soup! Made a batch last week and am making another one today. Yes, it’s a great comfort food, but if you make it ahead of time, it’s a great quick week-night meal paired with a salad or a great take to work lunch. Who new that homemade could be so simple and delicious! Thank you for this! So glad you liked the soup! Made this soup last night for the kids and it’s a WINNER!!! My son ate every bite and he hates veggies. Flavor was superb!!!! Thank u. Just tried this recipe for my daughter and I who are both under the weather. Very easy and delicious! Thanks!! My fiance asked me to make him some chicken and rice soup. I’d made some before from a recipe I’d found on the internet and it was more like a casserole…..too much rice and not enough broth. This recipe was just right and so delicious. Thank you for posting such an easy-to-make recipe. This is a keeper. Oh and I’ve printed the chicken noodle one out so I can make that one next. Thanks Guys! Glad you enjoyed the recipe! I hope you like our chicken noodle soup too! Hi, I just made this and it came out pretty yummy. The only thing is that I had to add about 6 more cups of water because the rice absorbed too much and it looked like all rice. Other than that, it turned out great. I’m freezing it, it will make about 4 different meals for 3. Thanks! I am making this now. It’s got about 10 minutes left to cook. I substituted about 1/2 teaspoon thyme leaves because I didn’t have fresh thyme. It smells wonderful already. I am sick and wanted some chicken rice soup like my mother used to make. This recipe seems similar, except for the garlic. Can’t wait to try some. Thank you. This is my type of cooking. I am old in years but a beginner to cooking. Just got a present of a first class cook book but…. cannot find any recipe in it that does not have something I don’t understand or cannot get. I am really looking forward to trying the chicken with rice soup. Thank you again.! I did not read all of the comments, so perhaps you have already answered this question. I’d like to know, how many people does your recipe feed? Thanks. Thank you so much for this recipe! It looks really easy to follow and your explanations are perfect. I have a question though, if I don’t have chicken broth, can I just make some by adding spices to the water that I am going to boil the frozen chicken in and use that for the soup later on? First time trying cook soup from a recipe. You two are made me feel great about my beginner level cooking skills. Delicious soup and my apartment smells amazing. I love chicken rice soup it is so awesome !!!!!!!!!!!!!!!!!!!!!!!!!!!!!!! it is my new fav! Very good soup and best of all my wife loves it! I did make my own broth but, other than that, followed the recipe exactly. I make about 3 different types of soup at a time, freeze them, and eat whenever I’m in the urge for soup. I personally believe soups & stews are better after frozen. When a soup calls for rice or noodles, I don’t added to the soup when cooking. Whenever I get ready for the soup, I cook the rice or noodles and add at that time (rice and noodles don’t freeze very well). Anyway, thanks for the recipe. I have cooked it three times so far and will continue to cook on a regular basis. I plan on making this for my family tonight and was wondering how many this recipe feeds? Thanks! Hi guys I posted your recipe with my modifications on my blog. I can’t get the url to copy/paste but just look up Librariandoa and there I will be. this soup is awesome! I made it a few weeks ago and there was no leftovers…my girls son is a very picky eater and he gobbled up 2 huge bowls! tonite i am making some more, ive been sick and need of some comfort. thanks for the recipe. Just used my leftover turkey from Thanksgiving instead of chicken which made it super easy and just as tasty! Just made this for lunch with leftover rotisserie chicken. The recipe was super easy to follow and quick to make!! Followed it to a t and it tasted awesome. My 2 1/2 year old son is asking for more. Thank you for a yummy recipe! Pingback: I’m Obsessed… | eat. run. travel. Awesome! Although I used an additional cup of broth instead of the water. this is still cooking on the stove but husband already said the house smelt good and we took a sip of the broth and it’s very flavorful. I can tell were going to love it! Hello everyone, tried the rice soup. Excluded a few ingredients and it was great! I omitted the chicken and added potato, zucchini, and plum tomato (small cubes). Also, I did not add the thyme because I did not have it, but I still included the bay leaf. It was great! Thanks again. Add in some New Mexico green chile and you’ve got yourself a sickness killer soup! Which is what I’m doing right now. Thank you! I love this chicken soup recipe. Use it all the time. Only thing I changed is to put brown rice in instead of white rice. You have to extend the cook time by 15 minutes but it tastes great. I love to make with my lefteover after I’ve roasted a chicken. Love it! Made it last night cuz I’m a little under the weather. Quick question tho.. 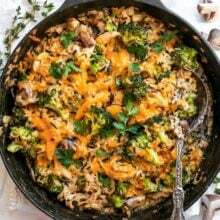 So u have any of the nutritional information… I use a fitness app where I have to put in my calorie intake and all that jazz..
Pingback: Chicken and Rice | Never Enough Thyme — Never Enough Thyme - Recipes with a slight southern accent. My husband and I love this recipe! I add sliced avocado to my bowl and stir it in and it makes the soup creamy without adding dairy, heavy creams and bad fat! I would save the water you cook the breasts in for the soup; why waste it! This is my second time making this soup! Thank you so much for an easy rice soup recipe! To make this recipe even easier I buy a rotisserie chicken from the deli to use. The first time I made this it didn’t look like enough rice when I first added it, so I added some more! But I forgot it’s regular and not 5 minute rice, so it puffed up quite a bit! So I had to add more liquid and chicken seasoning. But it still turned out great! Everyone in my family loved it. Especially my mom whose picky about soups! It freezes beautifully as well. I just add a little more chicken broth when reheating it. Thanks so much. Definitely one for the recipe box! the perfect recipe for my homemade stock and the temperatures in the teens…added some kale to the other vegetables. can’t wait until it’s finished, thanks for sharing! So I researched it and tried a few out and this is well and truly the best variation that I could find. Mmm sooo good, a definite favourite!! This recipe is definitely a favorite. I make my own chicken stock and add kale…absolutely delicious, thanks for sharing! I got a hint about cooking chicken for soups from a friend. Buy chicken tenderloins when they are on sale. Season them and then put them in the crockpot covered with chicken broth and cook on high for about 2 hours or until no longer pink. Cut into small pieces, wrap and freeze in individual packages. I just did it this way and have enough to make 4 pans of chicken soup, so that when I am ready, voila I will just pull a package from my freezer to thaw and they will be ready to go. How many servings is this??? I have a question regarding the rice. Should I pre cook the rice before adding it in the soup like I would do the chicken? Or should it be still be hard when I add it to the other ingredients? Half way through cooking it and it smells amazing. Thanks. Very well liked by the meat eaters in our family for Soup Monday. I followed the recipe, other than not cooking the chicken for an additional thirty minutes after it was cooked. More like ten minutes to warm it up, and that was enough. Thanks for a good recipe! This is, hands down, the best recipe I have found on Pinterest! It is so easy to make and is my husband’s absolute favorite soup! He is always on a diet and this soup is great for anyone watching their weight! I have been making this for over a year now and will continue to make for years to come. I actually have the recipe memorized due to the numerous times I’ve made it! Yay! So glad you like the recipe. About how many servings does this recipe make? This is pure comfort food in a bowl! This soup looks so yummy! I can’t wait to make it soon! Perfect to warm up with on a cold day! Lovely new pictures and a wonderful oldie but goodie recipe Maria! hey girl- yummy for my tummy! Yes! I’m with you! I have terrible pictures from my first year of blogging that still show up on Pinterest as well and I’m like, “Why won’t those ever die?” But your pictures of this soup are amazing and make me want to eat it right now. Such a great soup for these cold days! We love a great soup recipe! Looks fantastic! I love chicken and rice soups! Simple and nourishing!! I just made the soup last night. It was amazingly easy and if you use precooked chicken it’s a one pot meal. It’s awesome that the rice cooks in the same pot. My family is all struggling with colds and this soup hit the spot. Even my picky 17 year old loved it! This looks delicious and still healthy. Love it and cant wait to give it a go.. Recipe needs correction — not 1 cup of rice, but perhaps 1 cup of COOKED rice! Next time I’ll try it with 1/2 cup uncooked rice. Otherwise this recipe is fine for a quick, simple, fairly bland soup perfect for sickbed supping. I love chicken and rice soup. I am glad I found your recipe because I had evrythng the recipe called for, for once. It was flavorful and quite tasty. Glad you liked the soup! BEST SOUP EVER! I cooked two packages of chicken thighs in boiling water then put them in the blended on low pulse which shreds them perfectly. Followed the recipe to a T and it turned out perfectly. I made this yesterday and it was awesome. No changes. So I made this exactly the way it said . It was so bland. I added more thyme and a bunch of garlic salt and one more clove of minced garlic also mushrooms. It came out wonderful. It was a simple base to start off with but I’d add a bit more ingredients. Made this tonight and it was delicious. Had to cut back on the amount of chicken stock for our needs, but still good! Very good. I added barley instead of rice and frozen peas at end. Brought it to a function and it was all gone. This soup was so easy yet hearty and full of flavor. I did not have fresh thyme so used dried in sour whole sautéing veggies. Will make again and again. I made this recipe tonight, but I tweaked it slightly. I used raw chicken(as that’s what I prefer) and I doubled the cook time. At 30min I put the cup of rice. When it was done, I fished the chicken out and discarded the bones, cartilage and skin. Your recipe was perfect, seasoned excellently and super nutritious. I just made this soup, and it’s really good. Highly recommend this. Never thought of putting in thyme. Yummy! I made the Easy Chicken & Rice Soup for the 1st time. The soup was good but for me, I would reduce the 1 cup uncooked rice to 1/2 cup…was a little too much in the soup. Also it would be nice to see the number (ie) carbs, protein, etc in 1 cup for Diabetic & weight watching people. The soup was pretty tasty otherwise. This soup is delicious indeed just that I’m using celery instead of carrots. Nice share! This was super simple to put together and well worth it. Its a keeper! Would using wild rice in this work? Yes, it might take a little longer to cook. Why dump the water from the chicken breast? Use it as broth. So I made this last week with brown wild rice and it turned out so amazing… I made it again today and used the long grain white rice and I inadvertantly turned it into a rice dish. I will make it again, but with the brown wild rice. This soup is sooo easy and soooo good! I’ve made it several times already! 🙂 I switch the thyme for Parsley. But other than that, I follow the recipe to a T. Comes out great every time. I have a sickly adult granddaughter with the flu and this looks just perfect to make for her. Thank you for sharing this recipe. I will be making it for dinner tonight. Hello, this is my first recipe from Maria’s site. I recently caught her on live on Instagram and realized that although I have been admiring her site for almost two years, I hadn’t made any of the recipes. . So, I was certainly overdue. Let me tell you, this recipe comes together in 30min! Very delicious! Having made this delicious soup, I will definitely cut the rice to 1/2c next time. The soup was more of a “stoup”-what Rachel Ray calls a stew/soup combo. Please do make this! We made this soup out of leftover turkey meat. Added a couple of extra carrots simply because we like them. Followed the recipe to a tee and it is wonderful. Will make again real soon. Thanks for sharing! This is great. I love a warm comforting soup recipe. And it gave me a great idea for lunches! How perfect to bring to work with me. I feel you on the photos. I’ve only been blogging a year, but I go back to my early photos are they are horrendous. I mean, totally awful. Your phots looks amazing now! So yummy easy and made with love – one of my favorites!!!! Very delish! Used dried thyme because I did not have fresh. Very good soup, served corn muffins with it! Wonderful to eat while I watched the snow fall. This is so easy to make and so delicious, my husband loves it. This is an excellent soup! I made it for my son who had the flu and prefers rice over noodles. Yo u won’t be disappointed. My son wants the recipe….that’s the sign of a great soup! Thank you for this great recipe, I’ve got the flu and decided to find a good chicken soup recipe. This was simple and delicious and I had all the ingredients on hand. Great! I added organic bone broth, turmeric & oil of oregano because I wanted to boost our immune system and help calm inflammation. So good and easy!!! Wonderful recipe, everyone loved it! Should the recipe have said to cover the soup while it simmered? I set the timer, went to feed my baby, & came back to find that all the liquid had evaporated and the chicken had dried out. Otherwise, the flavor was good. I made this soup and it was delicious. I used a wild and brown rice blend, and I’ve had a bumper crop of lemons, so I added lemon juice and then also threw in some lemongrass. It was delightful. I’m making it again today! The soup was so watery and not much flavor. I fixed it by adding additional rice and seasonings. While one cup of rice was not enough, 2 cups was too many. The recipe looked to me like it was going to be too watery for my preference, so I doubled the celery and carrot. Really tasty soup – especially second day! Some of the photos I see look like there are diced potatoes in the soup. Does anyone else see that? Regardless, that’s not a bad thing. All in all, I’m going to make this based on how good these photos look. Good on you two peas! Your soup sounds delicious and nutritious. However, I went through all the postings (comets and replies) and are amazed how no one is asking you about calorie count. Would you please kindly let me know how many calories per cup your soup have. Thanks. Been craving some homemade ckn soup, had leftover ckn. Added just about everything I cld including biscuit dough on top. Home sick, decided to treat myself. My home smells sooo good even w this stuffed nose. I wish you would add the nutritional values to your recipes so I can figure out the Wegiht watchers points. Great simple recipe!! Although, just cook the rice already and add with the chicken so you don’t have to wait an extra 25 mins! This soup rocks. I have made several times and it is my go to comfort soup when it’s cold. I freeze small serving sizes to take to work for lunch. Thank you! This is the best chicken & rice soup I have ever made. I get so many compliments and was even asked to go to a friend’s house and make it for her. It is my go to for whenever I want soup! This soup is so easy, and my whole family loved it! The fresh thyme really puts the flavor over the edge. Also, after finding out that I had multiple food sensitivities…I was excited that everyone in our family could eat this! Win win! I ♡ using fresh thyme from my garden. Do you need to cover it once you add the rice ? Made this soup tonight. It’s a keeper and will be my go to chicken and rice. I used 1 teaspoon of dried thyme as a substitute and added a sprinkle of dried parsley for color. It was so good!! A very useful recipe and a good piece of information. I’ve tried it, the result is very delicious. Thank you for the recipes you have shared. I wait for the next recipe. Made this three times. Grandkids love it. 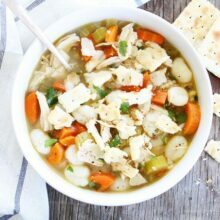 Best chicken and rice soup and so easy to make. Always a hit at our house! My sister in law started chemo for breast cancer and I took kher individual meals to freeze. This is one of the recipes I cooked. The only things I did differently was a turkey breast instead of chicken. She loved it! So glad she enjoyed it. Sending our best to her and your family! The soup looks a little bit plain,no colour though it is a nice meal. Here’s another thing you can add: A pinch of Spanish Saffron threads, maybe 6 total. It lends a lovely fragrance, taste, and color to the soup and pairs well with the rice. I also add parsley to my soup as well as celery tops (Most celery today only has a few remaining leaves or a few in the hearts. I chop them up and keep adding to a bag in the freezer after I’ve pre-frozen them so they won’t be one big clump). First time I made this lovely soup, very tasty with thyme and garlic. All the family enjoyed it. Combination of rice and spicy chicken makes perfect dinner meal. Already feeling hungry! I will definitely try this. Thanks for sharing wonderful recipe! Just made it for the first time. So simple so easy, so tasty. My only quibble. Go easy on the rice, have an extra 500ml of stock on hand. Loved it and thank you. This soup would be much better if you make the rice separately and then add it at the end. Cooking it with the broth and vegetables makes all the broth adsorbed in the rice, making it nearly brothless. The soup became more of a mush instead of a stocked based soup which I was hoping for while suffering a cold. I felt the same after my first pot, especially using brown rice. On the next pot, I cut back on the rice to 3/4 cup. If nothing else, just add another cup of water and increase your seasoning if it’s too watered down. I made your soup as it was real easy compared to other chicken soup recipes. I used rotisserie chicken to make it easy on me because I am sick and pushed myself to make this soup because I didn’t want to bother, but know having something homemade is going to do the trick rather than go have canned soup. Since it was soo easy it took less than a 1/2 hour to prepare. Now it’s in the pot cooking. I can’t wait to eat it as it smells really good. Thank you for not using ingredients that are hard to find as that is another reason I get deterred and long and complicated. But not this one. This will be something I will make often due to it being so easy and fast to make. Amazing recipe! As my best friend, okay my ex-wife, says about every recipe… “Make it your own.” I love leafy greens so I added organic kale and 1/2 tsp of cayenne. I’ve made this three of the last four weeks and cannot get enough of it. My next venture is to make my own chicken stock. When I make this recipe the rice always absorbs all of the liquid by day 2. Any tips? I swear I make it to the recipe! Home with pneumonia. So, so sick. Needed nourishment and all I wanted was chicken and rice soup…not canned but homemade. Google brought me to you. Read your recipe plus some of the comments. My version was bone in chicken breasts, then cooked the rice in the chicken breast water…no fat because their was no skin. Cooked everything else as suggested, but added lots of garlic. Oh YUMMMM! I was so sick, took me 4 HOURS to cook chicken, wash, chop vegetables, then throw in the pot. The broth was as good as the soup. YUMMMMM, thank you! Just what this sick gal needed! I cooked this tonight following the recipe and it was amazing. Anytime I want soup I come to your page. Thanks so much for posting awesome soup. I wasn’t feeling well and this is perfect comfort food. i never tried to follow such good recipes at home. I would definitely give it a try. Lot to learn from your site. 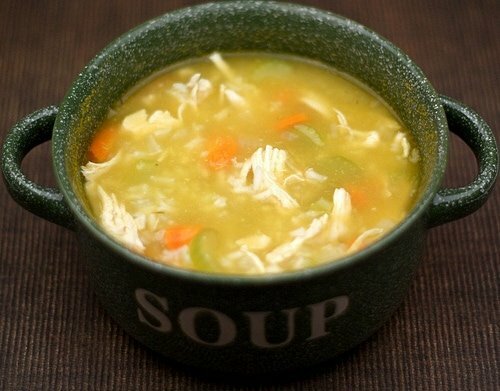 Chicken and rice soup is good for a cold, stomach flu and even a hangover! Thanks for this recipe. I have made it before the way you did and loves this recipe. I have never posted a negative comment before, but this website is WAY too busy. All I wanted was the recipe, and it took so long to get it I gave up. A lot of ads too. It was lovely, all my family enjoyed it. We just put a squeeze of fresh lemon and black pepper on after. Delicious. Our family has been sick and my husband asked for some chicken and rice soup I made it just the way you suggested and it hit the spot thank you! Best chicken and rice soup ever! Love it. My grandson always wants me to make it for him. So nourishing and comfort food. The thyme adds such a wonderful flavor. Thank you for this recipe. I have rice already made . Can i just use it? Yes, stir it in at the end. I just made this soup and it was really, really good! I followed the recipe but added about 4 extra cloves of garlic, added an extra carrot, only had one chicken breast and only had about 2/3 of the chicken broth on hand. Also used brown rice instead of white. Fantastic!! This would be great with some toasted bread. I separated it into individual, covered glass bowls and froze about 2/3 of it. I plan to make more very soon. The soup was easy and tasty. But one cup of rice was far too much and I had to add another quart of chicken broth. Sounds perfect!! Would Jasmine rice work as well? This is my second time I made this chicken soup today and same thing happened as it happened first time. First time I made, I added extra 1/4 cup long grain rice thinking enough of liquid and it looked like porridge even though taste was good. I followed recipe this time and same thing happened again( hardly any broth) I don’t know what I did wrong this time, used same long grain rice,25 min cooking. Recipe says chopping onion, carrots but when I saw new photo, it was more like cubed or diced. That might be the reason? Any advice? Thanks. Man oh man . .this looks so clean and yummy…I’m currently under the weather but will be making this soup tonight!!! Oh…do you think I could just cut the veggies up and put them in the pot without sauteeding in olive oil? ?